GELEEN, NETHERLANDS, July 22, 2015: A new series of styrenic block copolymer elastomers from Teknor Apex Company exhibits performance comparable to that of thermoplastic vulcanizates (TPVs) widely used in window gaskets while offering new options for building product manufacturers. In introducing the compounds at Fakuma 2015 (Stand B5-5315), Teknor Apex will highlight its multi-material capability as a supplier of both TPVs and styrenic TPEs. 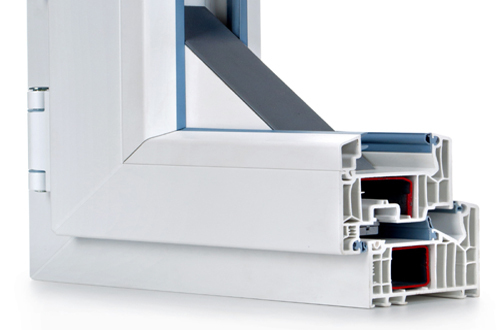 Unlike most TPVs used for weatherproof seals in metal, wood, or PVC window frames, Monprene® IN-23000 Series styrenic block copolymer compounds are readily available in small lots and pre-colored grades and require no pre-drying. Some grades in the new Monprene IN-23000 series can be processed with the same tooling used for PVC profiles at similar throughput rates and die pressures. “We have adjusted the viscosity and melt strength of Monprene IN-23000 Series TPEs to increase throughput while reducing or eliminating the common problem of die drool,” said Gert Joly, European R&D manager for the TPE Division of Teknor Apex. In the coextruded structures widely used for window gaskets, Mr. Joly added, all of the new compounds exhibit excellent adhesion to the polypropylene or high-modulus TPE substrate that serves as the rigid supporting component. They provide sufficient stiffness to facilitate window assembly and, unlike most TPVs, resist staining from paints. Like TPVs, Monprene IN-23000 Series TPEs exhibit the end-use properties essential for air- and moisture-proof window gaskets, including rubberlike seal recovery, low-temperature toughness, and UV resistance, noted Mr. Joly. A table of properties accompanying this news release compares two Monprene IN-23000 Series compounds with a Sarlink® TPV compound (also available from Teknor Apex) for use in the flexible seal segment of coextruded window gaskets. In addition to such compounds, Teknor Apex supplies higher-modulus Monprene IN-23000 Series grades, as well as Sarlink grades, for the supporting segment. “In offering styrenic TPEs alongside TPVs, Teknor Apex has taken a ‘polymer-neutral’ approach to the market for window profiles, expanding the range of options for building product manufacturers so that they can select precisely the best compound for their requirements,” said Stef Hordijk, senior market manager. Teknor Apex can produce Monprene IN-23000 Series compounds at all of its TPE manufacturing locations worldwide, ensuring dependable and steady supply in any region around the globe. “As a custom compounder, we are well prepared to accommodate customers who require rapid sampling, small lots, or pre-colored compounds,” noted Mr. Hordijk.